The distinguished Dean of the Lutheran Brethren Seminary, Dr. Eugene Boe, has a new title. It is Research Professor of Systematic and Historical Theology. LBS President David Veum announced that Dr. Boe will continue teaching classes, lecturing at the invitation of congregations, and, hopefully, begin publishing material he has developed over his 35 years at LBS. Speaking on behalf of the Church, we are thankful that Dr. Boe sees the seminary faculty as servants of the Church. As the Apostle Paul stated his call, “…what we preach is not ourselves, but Jesus Christ as Lord, and ourselves as your servants for Jesus’ sake” (2 Corinthians 4:5). Eugene embodies this calling in contrast to the many who view a seminary as an independent theological academy. In other words—and this is very important to congregations and clergy—Dr. Boe sees himself as a churchman, a Minister of the Gospel, called to a teaching responsibility. As a servant of the Body of Christ, he maintains close contact with congregational life. Guided by his conviction that the Scriptures are inspired by God, Dr. Boe has anchored his pastoral students in God’s Word. For example, he not only taught the doctrinal positions of the Church, but also the Scriptural basis for her doctrine. He insisted his students base their theology on sound exegesis of the Bible. 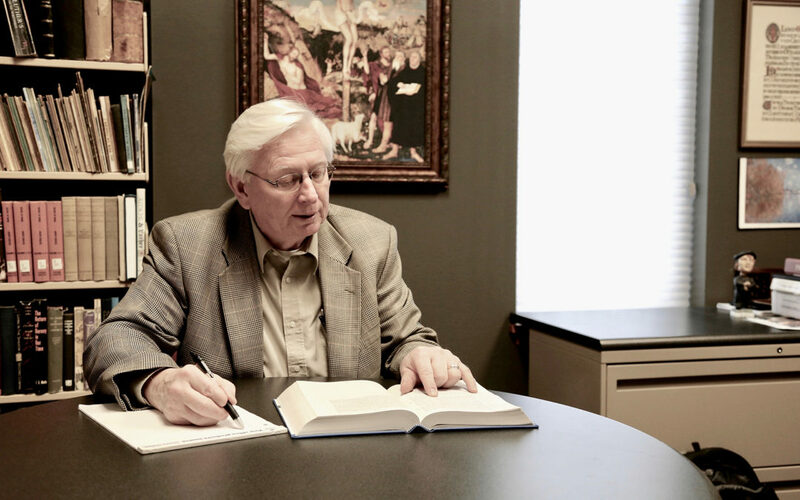 In his instruction of apologetics, defending the Christian faith, Dr. Boe required his students to connect with and share Christ’s message with non-believers. Thus, students learned to articulate God’s Word accurately with co-learners in class, and conversationally with non-believers in coffee shops. Professor Boe loves the academic world, but he sees himself, and his seminary colleagues, as people of the congregation. Therefore, he responds to the Church’s calls for research and theological essays on issues facing the larger Church while also accepting invitations to teach and preach at area conferences on themes suggested by local planning committees. He is enthusiastic about theological forums but equally so to participate in Bible studies. I know Eugene “Gene” Boe would emphasize the leadership roles President Veum and the seminary family played in the following achievements, but all these occurred during Gene’s service. Dr. Boe assumed more management responsibilities when he transitioned from Academic Dean to Dean of the Seminary. This allowed the President to give priority to congregational relations, engagement of student candidates, and denominational responsibilities. Second, the Seminary earned full academic accreditation during Boe’s tenure. This recognition of the Seminary’s quality and effectiveness makes it much easier for graduates to pursue advanced degrees and apply for financial assistance. Dr. Boe led the Seminary through in-depth curriculum reviews. Courses were re-aligned to prepare biblically-shaped servants of the Lord. Further, classes were placed online, allowing students to complete seminary programs without moving to Fergus Falls, Minnesota. This was another significant achievement and a ministry to the extended Church. Few of us realize the vision, energy, and endurance these types of changes require. Fourth, I need to mention the new Seminary classroom and office facility. Dr. Boe—envisioning and working with President David Veum, the Hillcrest Academy administration, and CLB executives, recommended the construction of the new building to the CLB Council of Directors in March of 2014. It passed without a negative vote! The congregations and ministries of the CLB are appreciative of Dr. Boe’s willingness to listen and learn from concerned, sometimes critical, comments. He is a student of the Church and church life. I need not tell you that he loves reading. He loves God’s Word. He allows the Holy Spirit to use both suffering and Scripture in shaping his theology. Many may be surprised that Dr. Boe was in management training for a major company when the Lord called him to prepare for the Christian ministry. In looking at his leadership as the Dean of the Seminary, one can see how the Lord integrated his corporate experience, educational achievements, congregational ministry, engagement with colleagues and students, enjoyment of people, and family encouragement in giving the Church a gifted Dean for these twenty years. Rev. Joel Egge served as president of the Church of the Lutheran Brethren from 2000 to 2014.